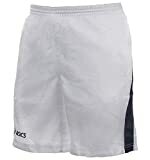 These shorts are lightweight and comfortable and come with useful pockets to store tennis balls while you serve. With a looser fit around the legs, it gives you added breath-ability and greater movement around the court. Double front pocket, Contrasting insert on the left leg, Asics logo printed in contrast on the right leg. This entry was posted in Tennis and tagged Asics, Court, Mens, Shorts, Tennis by FPSports. Bookmark the permalink.